I distinctly remember being five or six years old and watching my mother in the choir loft from my fourth-row pew. When the service seemed long, my remedy was always to break open a hymnal and sing all my favorites in my head until the final amen. Of course, I never realized the theology I was absorbing. And the reason I remember every bit of it is that it was music, arguably one of the most powerful forces God has ever given humanity. During our recent Vacation Bible School, I came through our Sanctuary and watched the adult volunteers leading music, breaking a sweat and working hard, in a laughing-and-happy sort of way. The children were singing fun classics such as This Little Light of Mine, His Banner over Me is Love, and Pharaoh, Pharaoh. But they also sang A Mighty Fortress is Our God, Martin Luther’s best-known hymn. These lyrics are not for the faint-hearted; rather, it is somewhat of a battle hymn which recognizes the spiritual foes we all face: the world, the devil, and death itself. Why sing such a heavy song with children? The answer: why not? I am learning more and more that children are capable of much deeper thought than we give them credit for. Their questions about God are absolutely astounding: Who made God? Why did Jesus come as a baby? What do angels look like? As Christians, we can agree that our answers are found in Scripture. But we have another resource as well—the hymnal. Although children may not comprehend most of the concepts or even know the big words, hymns are a deep deposit of rich doctrine that is missing in much modern music, Christian and otherwise. This bank of knowledge from my own early history is one from which I still make frequent withdrawals. The late Bobbie Wolgemuth, a dear mentor to many moms at First Pres, knew more hymns by heart than anyone I have ever met. 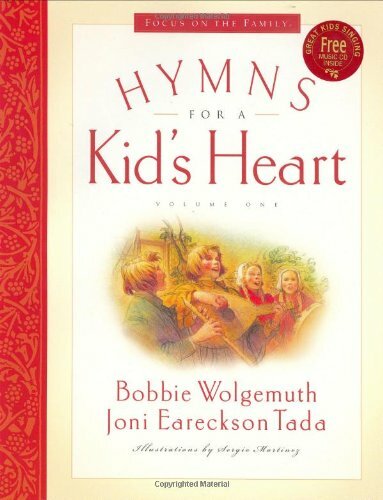 Her book series, Hymns for a Kid’s Heart, is truly a treasure of learning for parent and child. Bobbie recognized the value of hymns and could recall dozens upon dozens of them from memory. Many who loved and respected Bobbie knew that her faith was built upon Scripture and music, hymns in particular. What’s your favorite hymn? Check out this list for inspiration. Teach them to your children; learn them for yourself. I would venture to say that you also will benefit from these deposits of truth and build your own account of rich resources for the journey ahead.